BLOODSTOCK are excited to announce their first headliner for 2019! 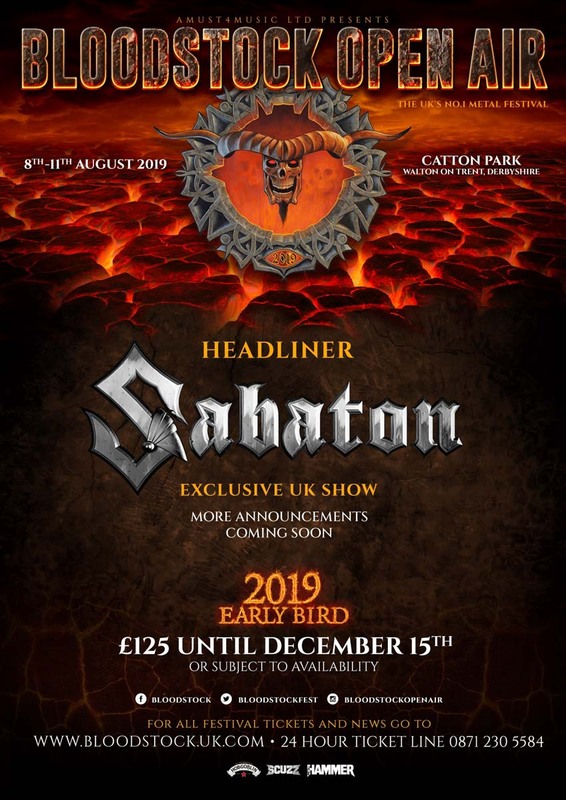 Swedish metal warriors, SABATON will headline Friday 9th August in what will be their only UK show in 2019! Check out what they had to say about returning to Catton Park’s hallowed turf to headline the festival this time around – https://youtu.be/a_m5jrhKUZs. The band have always been a huge hit with BLOODSTOCK’s crowd in years prior, so we’re excited to see them step into a headline slot. Remember their 2015 set when they brought their tank?! Watch them blast through ‘Metal Crue’ here – https://youtu.be/nt2pF7Bf944. Stay tuned for more band announcements soon! Standard weekend tickets are also currently available at ‘early bird’ prices (just £132 for four days of metal fun), so grab yours now at the ticket store – http://bloodstock.seetickets.com – if you want to save a few quid. Camper van passes are also available in limited quantities but be quick, half the available spaces have sold already! For those who want their VIP spot guaranteed, BLOODSTOCK’s first wave of 2019 Serpents Lair VIP tickets are also available, priced at £290. A second wave, including the Deluxe VIP packages (Luxpads, Bellepads, Podpads, etc) and a limited amount of VIP upgrades (for those who’ve already purchased standard weekend tickets) will then become available on 16th December at 9am. For full details click to http://www.bloodstock.uk.com/pages/vip-camping. We trialled the deposit scheme for VIP tickets in 2018, but please note, there will be NO DEPOSIT SCHEME for VIP tickets this year. In other excellent news, BLOODSTOCK is very proud to announce that the 2018 event raised a total of £11,872 for TEENAGE CANCER TRUST, via the guest list scheme, on-site donations and the charity stall at Catton Park. A great result for a very worthy cause so a giant THANK YOU to everyone who donated. BLOODSTOCK will take place at Catton Park, Derbyshire on 8th-11th August 2019. Get additional information over at www.bloodstock.uk.com.